We are the leading traders for Lipo Battery Voltage tester. 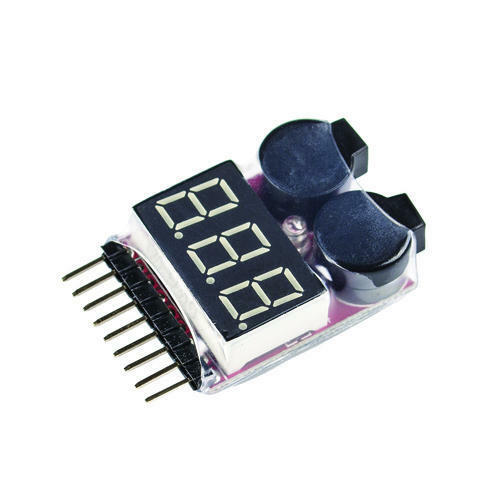 The LiPo Battery Voltage Tester Low Volt Alarm Buzzer and LED is a microprocessor controlled high precision voltage detector. The unit can measure each cell voltage in 1S-8S LiPo / liFe / liLo battery pack. The total voltage and voltage difference are displayed simultaneously. LiPo alarm will give a warming buzzer / LED when any cell voltage reaches any value you set in flight. Our Objective is to provide engineering and educational services to students and educational institute. Our Products are highly reliable and are widely demanded across INDIA.